I honor my friend David’s life by thinking about him daily, but I refuse to let the story of his death go untold. The worst part of his decline was watching him change from one of my role models of out-and-proudness to someone so vulnerable he seemed to believe he’d brought his suffering on himself. He had been a fighter, but for years before he developed full-blown AIDS, the stigma of having HIV had kept him from talking about it and, I assume, kept him in denial. By the time he couldn’t deny it anymore, there wasn’t much that could be done. In the sixteen years since he died, the stigma hasn’t faded much. We’ve got to keep shining light into that darkness. When the time came, David went home to die because the city hospitals didn’t want him. He went to a regional hospital near the no-stoplight town where he grew up. All of his sisters had worked there as nurses, so they made sure he got admitted. I had the unfortunate honor of keeping watch with his family for his last days. We cheered on his speedy death, which didn’t seem odd at the time, as he’d suffered a long time. One of his sisters suggested that we make a souvenir, something like, “David died, and all I got was this lousy t-shirt.” We agreed the only reason he would have disapproved was because he didn’t think of it first. Sometime during those last days, a nurse asked how long I’d been with David. I wasn’t his partner, but I remember feeling relieved that the way I cared for him could be interpreted as that kind of love. I did love him like a brother, maybe. It’s the closest comparison I know. We had selected each other as family and shared a kind of intimacy that only family can allow. 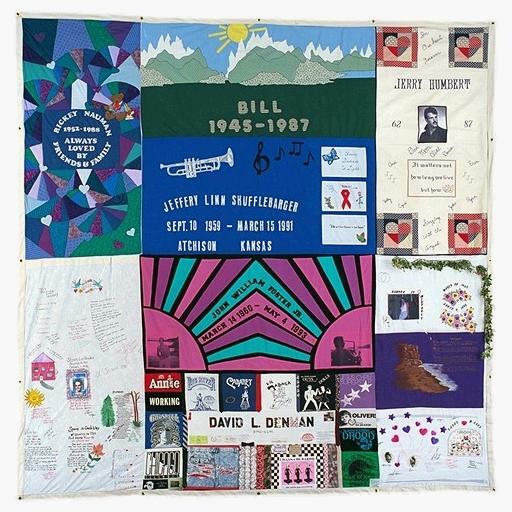 Here's David's panel in the Names Project quilt. He's downstage-center, of course. We had the window open a little so his soul could find a way out, but his healthy, 32-year-old heart just wouldn’t stop. Well into the third day of our vigil, his sister Julie touched my arm and said, “You know you’re welcome to stay, but please go.” As I walked to my car, the sunlight seemed too bright, the humid air too intoxicating. I didn’t deserve these gifts. I had to get home before I thought too much. I drove away as if I were trying to beat a storm, westward over two-lane roads, a single-lane bridge, where I waited at a red light, wondering as I sat there if David’s soul had found its way out of the hospital room window. I busied myself with the radio until the light turned green.